The earliest picture of the Korat cat breed is found in an ancient book called The Cat Book Poems written in the Ayudhya period of Siamese history spanning from 1350 to 1767. This book depicts seventeen cats that bring good luck and six cats that bring misfortune. 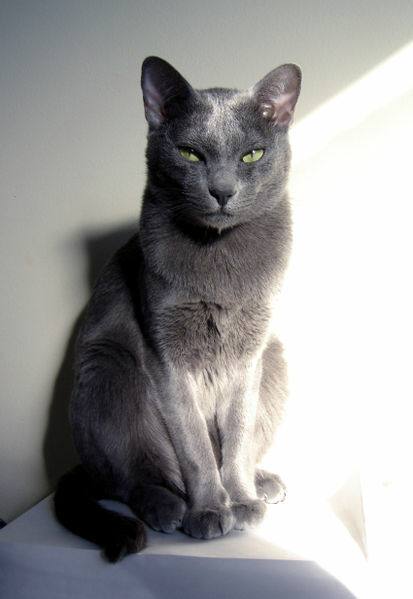 The Korat is one of the good luck cats. In 1959 the first pair of Korats were imported into the USA by Mrs. Jean Johnson. This pair was a gift to the Johnsons when the husband retired from the Foreign Service in Thailand. 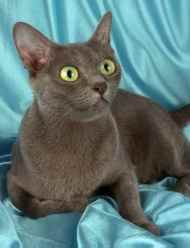 The Korat cat breed is a small to medium sized cat with males weighing 8-10 pounds and females weighing 6-8 pounds. The body is well muscled and powerful with a broad chest. The coat is short haired and single, making grooming easy. A weekly brushing will keep the coat in tip top condition. The head is heart-shaped and this is the only cat breed with this shape of head. They eyes are peridot (yellowish-green) and the eye ridges are pronounced. It can take up to 5 years for Korats to reach full maturity and the eye color also takes time to develop. Kittens start with blue eyes (all newborn kittens have blue eyes) that change to amber and then to peridot when they are between 2-4 years old. They like to be active and enjoy games that stimulate their intelligence. 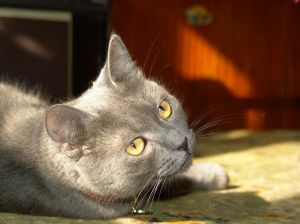 This is a perfect cat for a household where there are children as Korats are known to be very gentle with kids. Korats have extraordinary senses of sight, scent and hearing and do not like loud noises and disturbances. Some are vocal whilst others prefer to only communicate in a quiet chirp when they feel the need to speak.